With 2 clicks you can now make your own Sneaker Proxies. Pick any location worldwide to get started. Boom - magically your proxies appear and are ready to use. Ping from 0ms. If your speeds are slower than 10ms ping, you are failing every release. If you're not first you're last. Current Supported Hosts: Digital Ocean, Amazon AWS, Vultr, and Rackspace. We offer versions for everyone. From Basic to Reseller you can now make your own proxies. Make Sneaker Proxies Now. Low Ping. Cheap Cost. Results Every time. Our proxy software will allow you to simply create your own proxies. Our software will connect to the cloud, deploy a proxy, setup the proxy, and enable the best configuration automatically. You can control the proxy from your server dashboard anytime. Stop paying for proxies & start making your own today. Are you looking for the tools to manage a proxy reselling business? Our reseller version offers you the ability to add multiple API keys from the same cloud hosts. You can change all proxy username and passwords in a second. 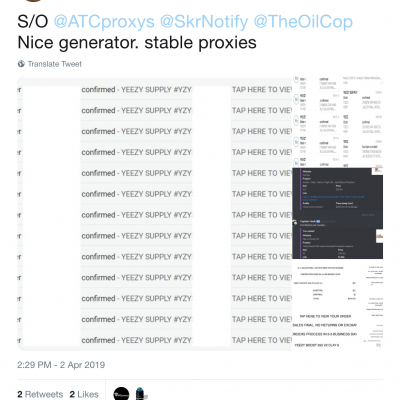 Proxy cleaner so the software will rotate through proxies you make and test each one to see if the IP is banned, and get a fresh IP if so until you have a full list of unbanned proxies. Fully customize the proxy authentication popup with your company name. No limits on API keys or proxies made.